When I was little and we had ice cream for dessert, without fail my dad would say, "I scream, you scream..." So of course, I needed to use this sentiment from Papertrey Ink's Comfort Food and Comfort Food Additions for my sister's birthday tag! 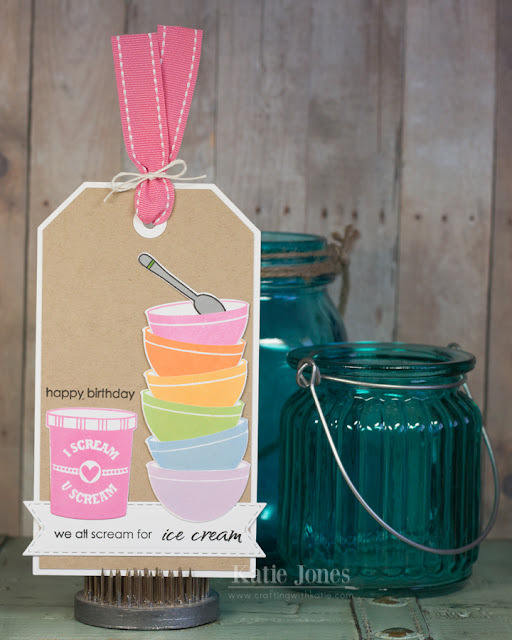 The little ice cream carton and bowls made with the coordinating dies are just too cute! I cut a slit at the top of each one so that I could stack them. The sentiment is stamped on a die cut made with one of the My Creative Time Sentiment Label Dies, and I made the tag with my Silhouette Cameo. Katie I love this! The colors and the stitching are both perfect!! Too cute!